Some pre-season fitness tips to get back into refereeing. The professional season has started and for many amateur referees the season will start soon as well (or has already started). But some of you might have just come back from your holidays or are still relaxing on a sunny beach. This story has a few great pre-season fitness tips to get you back on track, so you will be ready for the season. Personally, my season starts at the end of August. My fitness test is at the 20th of September. That’s why KNVB’s professional referee fitness instructor Hilco de Boer send out some pre-season fitness tips. These tips might be useful for you too, that’s why I share them on my website as well. If you have to do a test, make sure you start in time with training sessions. That’s you you will build up your physical ability. My FIFA fitness test is on the 20th of September, but I can’t start two weeks in advance. I have to build up my physical ability. Don’t go for quantity, but choose for quality. Going out for just a run five times a week seems sporty, but you can train your body better with two or three specific training sessions for referees. And the day after a game there’s no need to run for twenty miles, but another recovery training method can be much better. Make sure you pick the right intensity every time you train. Refereeing friendly games is the way to get back into the rythm. Being on the football pitch stimulates you to get ready for the season. However, the first thing you do after your summer holidays should not be refereeing a game. Make sure you have done five training sessions before you whistle your first friendly game. 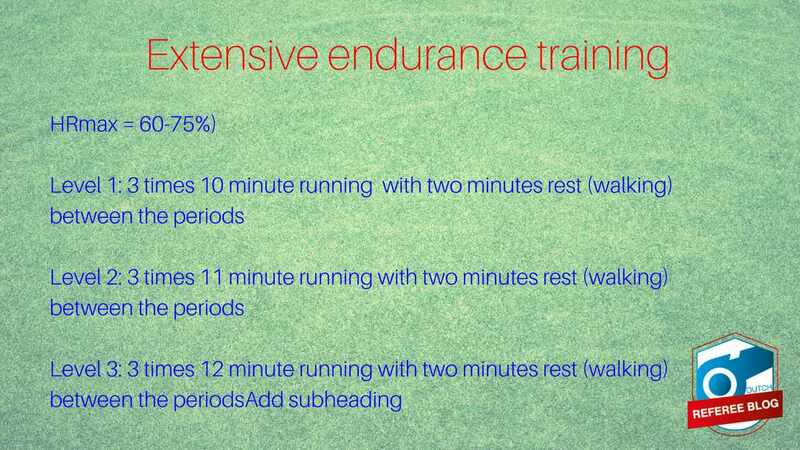 And during three of these sessions you should have done sprints. So a massage or recovery training the day after a match is important, because that specific training helps you improve your physical ability due to a good recovery. Holidays are nice. And many of you will be off for a few weeks. But don’t forget your physical ability. If your holidays are right before the season starts, make sure you remain fit. “It is needless to say, you should continue your training sessions then”, Hilco de Boer says. I got a document from KNVB with some examples of good training sessions for referees. I’m not the fitness expert and can’t see you personally. So always make sure you’ll listen to your own body and adapt the intensity of training sessions to your own possibilities and needs. During the coming weeks I will publish tips on fitness for referees on every Monday that will help you get your fitness schedule for the week ready. After a summer break the following excercise is a great start. It’s a so-called extensive endurance training session. The intensity is not high, but due to the duration it can make it feel intense. This training improves your endurance level. Make sure you do a proper warming-up and cooling down yourself. KNVB has added three different levels. If you use a heart rate monitor: maximum Heart Rate (HRmax) should be 60-75%. Every week I will share tips on physical training and examples of exercises. In an interview I did with Hilco de Boer, he shares why fitness is important for referees. Already curious what a weekly training schedule looks like? Harvey shares his training schedule with you. I am referee in Nigeria. I really enjoyed your thought on fitness tips for refereeing. Thanks. I will share more in the upcoming weeks. A specific speed is not useful, because physical ability differs per person. If you have the chance, measure heart rate and get to the mentioned heart rate. Otherwise take that percentage of of your sprinting ability.